There was drama at Kotido Police Station on Thursday (yesterday) when a local businessman stormed the station to file a complaint against Uganda Wildlife Authority-UWA for allowing rats to destroy his money. The man identified as Peter Lojok Longolangiro, paraded 5 rats at the station he accused of destroying Shs 396, 000 he had kept in a box. He also tendered in damaged notes, which he says were eaten by the same rats as exhibits. 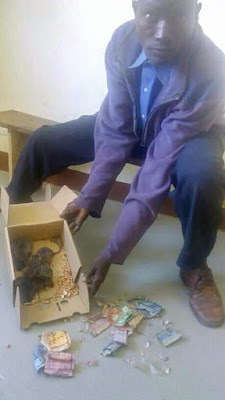 Longolangiro claims that the wild rats, which are part of the protected species by UWA, intruded into his house and entered the box where he had stored his cash. Police referred Longolangiro to the Resident State Attorney for expert advice on the case. Alphonse Ojangole, the Kotido District Police Commander told media he had never come across such a case in his 12- year of service with the Police Force.